Standard-fitting pullover with lace bands, set-in sleeves, rib waist sides and polo collar. Matching elastic thread is needed, with a note in the pattern that the sweater length shortens approximately 2”/5cm when elastic is sewn in at the waist. Note: Stipulated yarn is no longer made, so you will have to find one that knits up in the correct gauge. 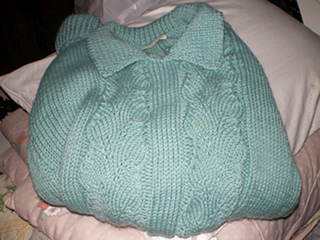 The yarn used by Vogue for this pattern had 135 yds/125 m per 50g ball and it was a mix of wool/alpaca/silk.